Knives in every shape for every use imaginable. Brands include •Tramontina •Cartini •Victorinox •Atlanic chef •Dexter russel •Shun, to name a few. Utility knives, fruit knives, vegetable knives, choppers, fish knives, fillet knives, meat knives, boning knives, paring knives. 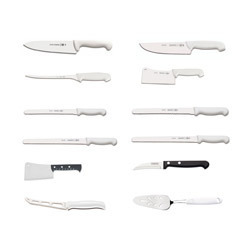 Atlantic Chef International Co., Ltd. is a knife manufacturer and exporter.Founded in 1977, the company has been successfully established over 40 years. Atlantic Chef uses German Steel 1.4116, which consists of Carbon,Chromium, Vanadium, Molybdenum and several other materials. Afterhardening/tempering, grinding, sharpening and some other majorO processes, the hardness of the blades can reach as high as HRC 56 andabove. The hand-honed, razor sharp blade edge also offers long-lastingsharpness, easy edge maintenance and rapid re-sharpening features. Atlantic Chef Cutlery is certified by NSF International. We are an eminent name, which is engaged in delivering Knife. The offered range of knife is available in different customized specifications to comprehend and meet the diverse requirements of esteemed clients. Along with this, the offered range of knife is suitably checked on different parameters to maintain its authenticity throughout the designing process. This range is designed utilizing high grade stainless steel, sourced from reliable vendors of the market. We are among the eminent organizations engaged in manufacturing, supplying and exporting Chef Knives. These knives are manufactured by using advanced machines and quality-tested material procured from the trusted vendors of the market. Along with this, our professionals make sure to follow the norms already set by the industry while manufacturing these knives. Available in various specifications and also in custom-built range, these knives are applauded by the customers for their features mentioned below. 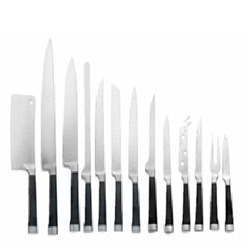 Looking for Kitchen Knives ?